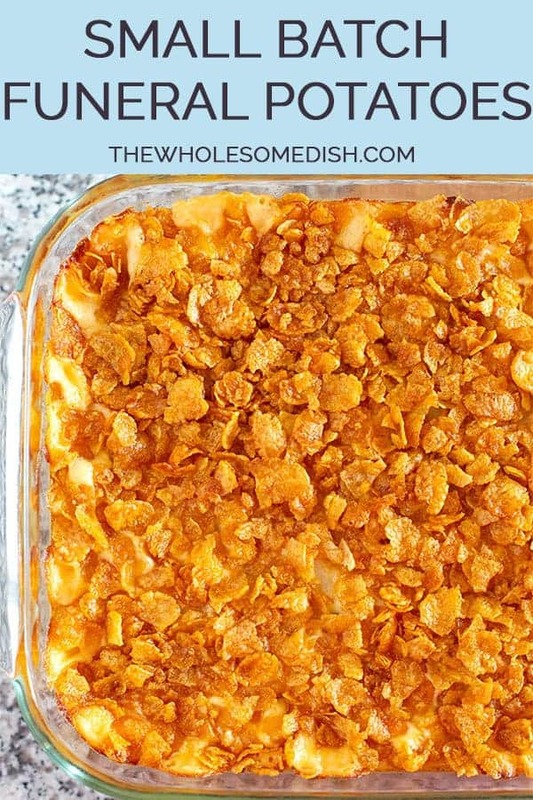 Small Batch Funeral Potatoes – AKA cheesy potato casserole with corn flake topping, party potatoes, or potluck potatoes – scaled down to make a great side dish. This cheesy potato casserole is absolutely delicious. 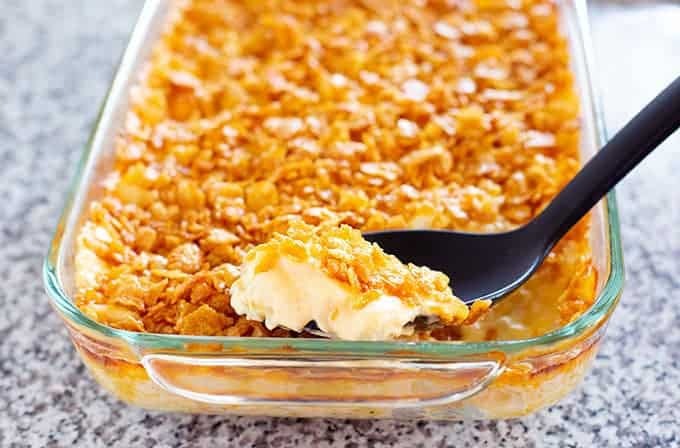 It’s base is creamy cheesy potatoes that get topped with buttered corn flakes cereal that get crispy when baked. 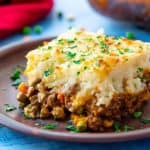 The only problem with this recipe (other than the name) is that even though it’s really good, I would never make it as a side dish because I don’t want to have to eat cheesy potatoes every day for a week. Problem solved! This small batch version of funeral potatoes is great for a side dish to feed your family. Now you don’t have to wait for a big event to eat these perfect potatoes. 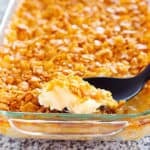 Small Batch Funeral Potatoes - AKA cheesy potato casserole with corn flake topping, party potatoes, or potluck potatoes - scaled down to make a great side dish. Preheat oven to 350 degrees F. Spray a 7x11 (or 9x9) inch baking dish with cooking spray. In a large bowl, add the potatoes, cream of chicken soup, sour cream, cheddar cheese, salt, and garlic powder. Stir until well combined and the potatoes are evenly coated. Pour the potatoes into the baking dish and spread them out into an even layer. Place the corn flakes in a plastic food storage bag. Seal the bag and use your hands to gently squeeze the bag and crush the corn flakes. Pour the crushed corn flakes into a small bowl. Add the melted butter. Stir to coat the cereal. Spoon the corn flakes evenly over the potatoes. Bake uncovered for 35 minutes. Cool 5 minutes before serving. I have never eaten funeral potatoes, they don’t seem to be a thing here in Australia. And I admit, whenever I have seen them before the name put me off, but the small batch nature of these intrigued me. They look delicious, and I am certain my kids are going to love them. We also call them Cheesy potatoes in the U.S. They are delicious. Try topping with crushed french fried onions instead of the corn flakes/butter. I was just wondering whether Frosted Flakes would work as I never got my Christmas marshmellow wreathes made. Need room in the freezer and would love an alternative potato recipe. Thanks for info about Frosted Flakes. We have done this for years but instead of shredded cheese we use half a block of velveta and chip some green onions and put on top of frozen potatoes. 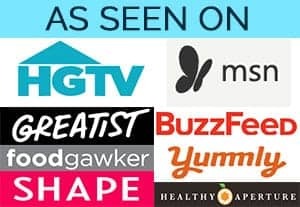 Everyone always raves about it!! Yummy! Never seen a cornflakes topping on potatoes before, must be so good and crunchy! Cornflake topping is making a comeback from at least 40 years ago. They or potato chips were the topping of choice in those days long past. Now that my mobility is poor, you may be sure that they will show up the next time I bring a dish to a family gathering. I can just hear the raves. This dish is rooted in the Mountain West region of the United States, especially the states of Idaho and Utah. The name may appear off putting, but if you’ve ever been asked to provide the post funeral service family meal you know how this dish got its name. This dish is the ultimate comfort food, loaded with tasty carbs and dairy. The original recipe also feeds a lot of people, as the author points out. You can substitute the cubes potatoes for shredded. We like to add some chopped onions into the mix for a little added flavor and, as we are not a fan of the cornflake topping in our family, we just top it with more cheese. Add some chunks of ham and it turns into a main dish. This dish also freezes well. We froze the leftovers from my father’s funeral and ate them over the next several months. Shredded frozen potatoes work better and we use crushed rice checks cereal instead of corn flakes. also grate an onion or finely chop one in a food processor and add it to the mix. For those picky eaters you can grate an onion with the smallest side of a box grater and you’ll get onion pulp and juice. That’s what I do in my homemade tarter sauce recipe. No crunchy onions for those who don’t like raw onion. I can’t wait to try these! Looks like the perfect dish for this fall. We call it a potato casserole. I need to make a full recipe, my family looks forward to leftovers. We like it extra cheesy. I substitute cheddar cheese soup and sometimes use fz. potatoes O’brien. Also my family likes Panko bread crumbs in place of flakes. 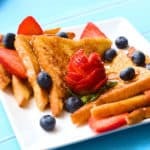 We love this dish!! Can I use shredded hash brown potatoes from the dairy section? They are refrigerated, not frozen? I use cream of potato soup because I am a vegetarian. You also use cream of asparagus or whatever you prefer. Finally a small recipe for funeral potatoes that I can make without having to invite the whole neighborhood over to eat so they don’t go to waste. Been involved in making these since I was a little girl of about 5 or 6. 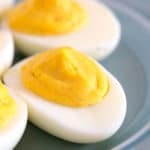 Great grandmother used to make very similar dish for family gatherings, harvest time meals and, of course, after funerals. Biggest difference however is she had to peel, cut and parboiled fresh potatoes. 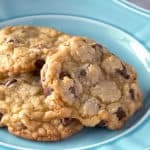 Thanks for bringing back those memories from so long ago and giving a smaller recipe for an old favorite. Question: any idea whether it’s best to freeze extras before or after baking …. or does it matter? I cook for one, but still make the full recipe frequently. I make an 8×8 pan to take to my daughter’s and split the rest into small dishes for myself and freeze them. Always delicious and can hold up in the freezer forever! On a “regular” base, can you use bran flakes to incorp. more fiber? Should work just will be darker top. Not sure how flavor would turn out but worth trying once to see. I use cream of celery soup instead of cream of chicken, we seem to like this better. I also use chopped up onion in the mixture. Sharp cheddar cheese works well also. I cannot stand the taste of sour cream, I just do not use it. 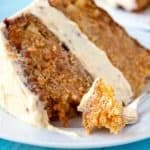 Could this recipe be made without it, Or maybe substitute something? Thank you! I’m thinking mayonnaise might possibly make a good substitute?